The first systematic excavations in Ostia took place under the aegis of Pius VII in 1802 (Marini 2000, 61-109). The first excavations were located around the Capitolium, as the uppermost part of its walls “had for centuries been the grave markers of a buried society, propped up above the silt and soil that had accumulated over the remains of the Roman town.” (Boin 2009, 30). Under the direction of Giuseppe Petrini, the Capitolium appeared from the accumulated earth (Fea 1802, 6.). During the period from 1824 to 1834 a number of unsystematic excavations occurred. The excavators focused solely on areas most likely to bring out inscriptions and sculptures thus paying no attention to architecture (Meiggs 1973, 106). Following these phases of excavations, completed areas were backfilled after the items were removed. This can be seen from excavations in 1922, where Raffaele Finelli recognised an area north of the Roma and Augustus temple as being backfill (Giornale degli Scavi 18, 1922, 117). In the second half of the 19th century, Rodolfo Lanciani organised campaigns east of the Capitolium, thus excavated the area between the Capitolium and the theatre, and stitched together the first urban image of Ostia (Lanciani 1888). The most significant change within Ostian research occurred in the first half of the 20th century. The excavations conducted in the 19th century searching for precious items preserved the still in situ pavement. When Dante Vaglieri, Ostias first official excavation director from 1907-13, conducted excavations in the northern part of the Forum, it provided Ostian research with a more systematic approach. 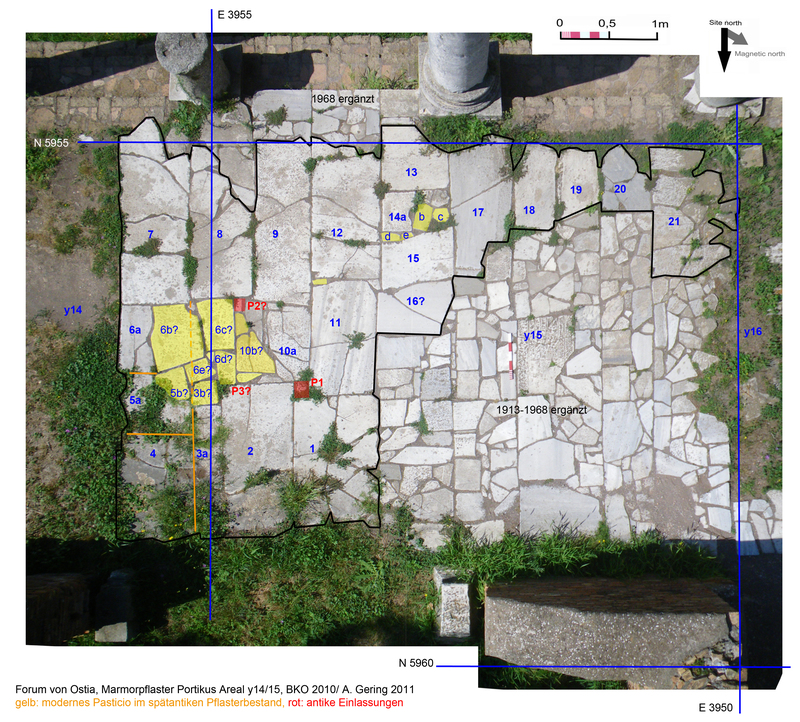 Deep trenches in 1912 and from 1921-4 conducted in the search of the Republican Ostia caused the removal of a big part of the late antique pavement (see picture to the right; Vaglieri 1912, 273-276; 1913, 299; Calza et al. 1953, pl. 2; Gering 2011, 458). Notwithstanding new advances in Ostian archaeology, such as stratigraphic excavations, photography, and field recording, no comprehensive publication occurred concerning the Roma and Augustus temple. A brief identification followed by epigraphic and sculptural remains, its phases, and a drawn plan by Italo Gismondi appeared in the Scavi di Ostia (Calza et al. 1953, 115-122). 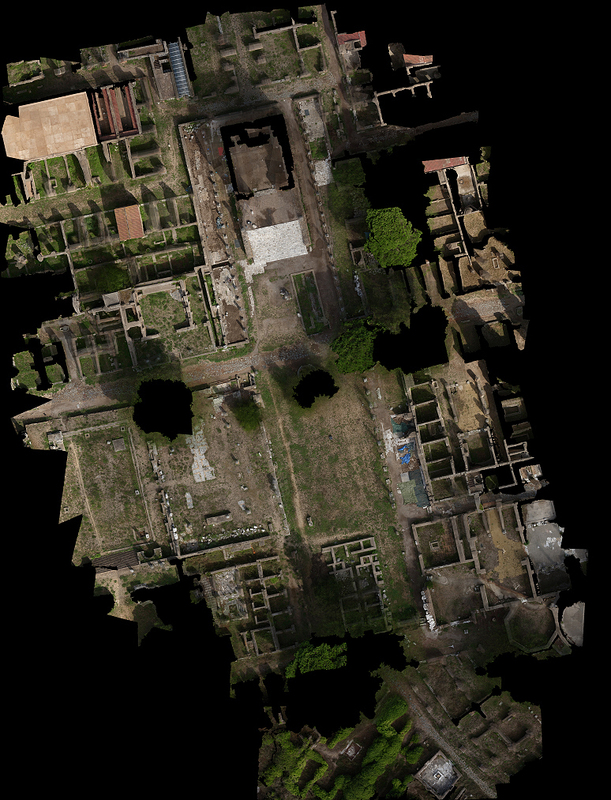 With Guido Calzas discovery of the Roma and Augustus temple, the southern part of the Forum was almost completely excavated (Calza et al. 1953, 34-38). The discovery of “aedes Romae et Augusti” ensued the rise of fascism in 1921. The context of the newly excavated Roma and Augustus temple ensured a perfect symbol of Rome’s glorious past. Two decades earlier the inauguration of a railway between Rome and its ancient harbour city made the connection between the two cities easier. This made the restoration and presentation of Ostia to an eager public a first priority (Calandra 2000, 439-440). The excavation of the Tempio Rotondo area during the late 1920’s was only photographically documented. The only publication so far comes from an english archaeologist visiting the site (Briggs 1930). In 1938, Italy’s fascist regime decided that the ancient city was to be completely excavated and prepared for display during the World Exhibition 1942 in Rome (Meiggs 1973, 109-110). In continuation to Calza’s former excavation works, the detailed documentation of finds and stratigraphy played only a minor role. A good example of how finds were manipulated is the completely modern statuebase built in the centre of the Forum apse (see picture to the right): neither the statue was found here, nor its base constructed with ancient bricks is in situ. Until recently, Late Antiquity was a small part of Ostian archaeology. The excavators in the period after World War I presented a decadent picture of late antique Ostia (Gering 2011, 409). Firstly, this statement was derived from their ideals and own set of assumptions about Roman history, namely the glorified period of the republican and imperial Rome (Boin 2009, 5; Meiggs 1973, 110). Secondly, their comprehension of an economic and cultural downfall in Late Antiquity. These set of assumptions led to few late antique attestations in the archaeology and to the idea of an entirely simple and shallow late antique renovation of the city. These conclusions are far from impartial. They were controlled by a vigorous practise of excavation, which led to a negligence of the late antique layers. Further, this led to an absence of stratigraphic observations and descriptions. The stratigraphy of recycling-processes in the early middle ages was often misunderstood by the excavators as indications of a final collapse already in the third and fourth centuries (Gering 2011, 409). 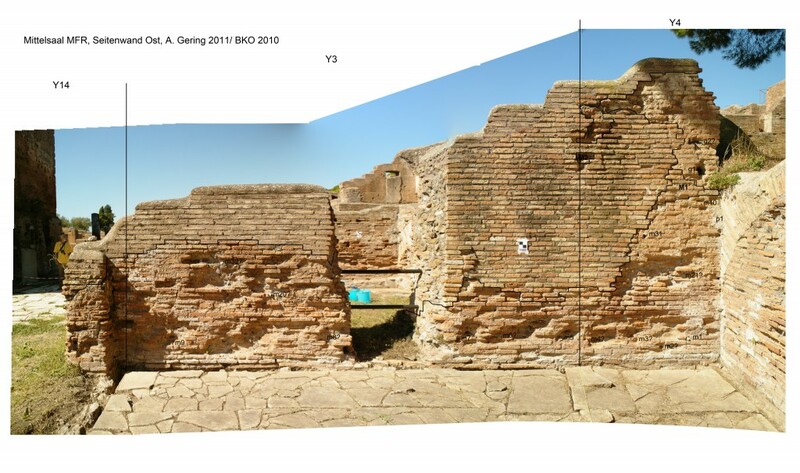 The historiographical record has since obscured a clearer picture of Ostia in Late Antiquity (Boin 2009, 2). Notwithstanding the most recent research, which has multiplied the archaeological attestations from the fourth and fifth centuries, the perception that Ostia had lost its significance during the third century remains constant. The late antique prosperity of Ostian culture is seen as a short phenomenon of renaissance, or is used as a phenomenon concerning the elites retreat to the town houses. An assortment of public buildings situated in the centre of Ostia originates from the imperial “boom” in the first two centuries. However, the diary of Finelli provides us with evidence of the late antique stratigraphy. His observations during the excavations in the 1920’s are vital for the understanding of the layout of the late antique pavement around the Forum. According to his journals, the late antique pavement lay 50-75 cm above present level (Gering 2011, 458), but in the published documentations Calza refused the existence of a late antique pavement, or any pavement at all with following words: “della pavimentazione del Foro non esiste traccia” (Calza 1928, 160) even though photographs proved the opposite (Calza 1928, fig. 55). 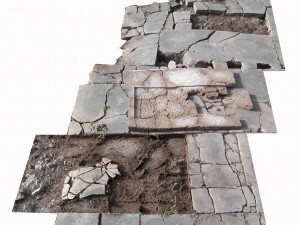 Recent excavations showed that a big part of the marble pavements and facades as well as representative buildings and monumental plazas originated from the late antique period. In spite of the problematic history of excavations a whole period of late antique architecture and urbanization emerges which is not comparable in other cities (Gering 2011, 411). Another problem encountered by archaeologists today is the circumstances that the old excavators restored a relative great quantity of pavement and architecture. At Foro della Statua Eroica (FSE), the Kent Berlin Ostia excavations (KBO/BKO) encountered some problems regarding the differentiation of ancient pavement and modern repairs, due to the use of ancient material in the modern conservation efforts. Archaeologists had to analyse context and building circumstances of the slabs individually (Gering 2011, 431-435). 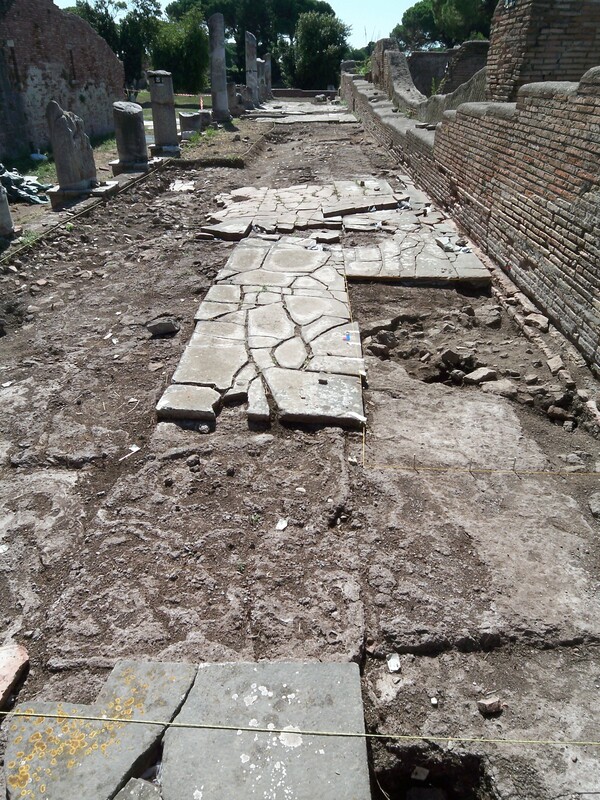 During the old excavations, modern reconstruction work was done throughout the Forum and its surroundings, thus devising a presentable pavement and architecture. A good example of this reconstruction practice is seen at the Decumanus in front of FSE. In 1912-1913 under the direction of Vaglieri different architectural fragments appeared in the bedding of the Decumanus (Vaglieri 1913, 299-303). 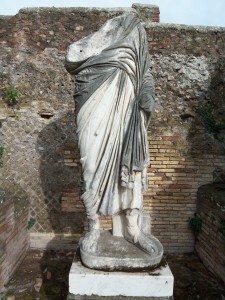 The largest of these fragments were placed on top of modern brick piers in order to provide an image of imperial Ostia. The smaller fragments were stored (Gering 2011, 419-420). Vaglieri also conducted the excavation of the north-eastern portico Main Forum East (MFE) in front of Main Forum Rooms (MFR) and parts of MFR itself with an agenda to uncover the republican phase. This caused the removal of late antique pavements, which Vaglieri characterized as being of a short transition (Vaglieri 1914, 93).